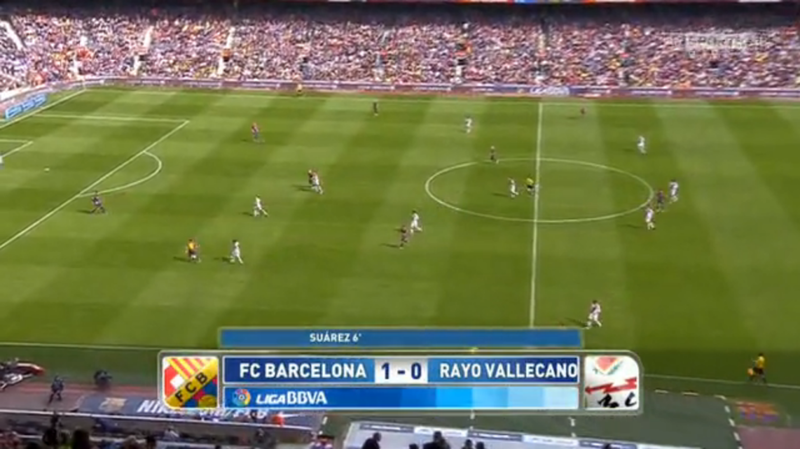 Rayo Vallecano displayed their aggressive pressing and brave football at the Nou Camp vs. the now top team in Spain. Barcelona’s players look in top form and managed to jump over Real Madrid for the 1st spot in La Liga. They did this with the general change in strategy which Lucho has implemented after a stretch of play which didn’t meet Barcelona’s high standards. Let’s see why the entire stadium was applauding the two teams even before halftime. The general shapes during the match. Notice Rayo pressing high in a sort of 4-2-4. This was the main topic for the match. The strategy of Rayo on defense was to press high and aggressively during Barcelona’s build-up play. So what does Barcelona do? You guessed it! They proceeded to build out of the back no matter how high the pressure was. But Rayo gave them an easy escape route for a large part of the scenes. Rayo pressed in a man-oriented fashion when they pressed high up the field. During a large part of their 4-2-1-3/4-2-4 pressing scenes, the central defender of Rayo Vallecano would step into midfield as well. This was to provide an extra man in midfield in contrast to Barcelona’s 3 central midfielders (with Mascherano dropping in-between Pique and Mathieu). So it would look like a 3-3-1-3 at times – though it was frequently manipulated by their man-marking. It sounds good in theory, but where the problem arose during Rayo’s pressing was around Barcelona’s fullbacks – Jordi Alba in particular. A lot of the time Vallecano’s central attacking midfielder would man mark Mascherano. The striker would then press 1 out of the two central defenders. This left one extra central defender open during the build-up – which is where Kakuta came in. He would leave Jordi Alba to press Mathieu. Barcelona used Bravo in build-up play very frequently, and he wasn’t pressed very often – this meant there was usually a clear path from Bravo to Alba (or whoever happened to be open due to the un-coordinated pressing). From there, a Rayo player (usually a central midfielder) will leave his mark (like Iniesta) to press the ball and just get the ball played in behind him to Iniesta. That led to many ‘breaks’ from Barcelona where they had an ascending advantage moving into the attack. A partnership between Messi and Alves has become more prominent since Lucho’s strategical change to use Messi in combinations on the flanks and move inside. The combinations between these two players provided some interesting reactions from the defenders. A lot of the time Messi would be near the touchline so he can move inside with more momentum, while Alves is in the right halfspace supporting him. So when Alves receives the ball and plays the ball out wide to Messi immediately – they begin a sort of ‘rotating’ motion. Alves begins moving up and Messi begins circling backwards and bounces the ball off of Alves midway through the movement, and then Alves ends up completely in front of Messi before Messi plays the ball back into him vertically (which attracts more pressure as teams naturally defend ‘vertically,’ meaning they defend their goal from the team who is approaching from their own goal – while horizontal passes are usually quite easy and without pressure). Once the ball is played into Alves and some pressure quickly gathers around him (this is all one-touch passing), he plays a final lay-off pass inside towards Messi who is now finishing off the rotating movement and running diagonally towards the center of the field with some relative freedom. It’s a very cool way to interchange positions and ‘alvessi’ have many other variations within their 2-man combinations that are quite interesting. This image highlights the general structure of Barcelona’s attack. Alba and Alves high on the wings, Messi, Iniesta, and Xavi in central midfield, Suarez and Pedro in the front line. In general Barcelona had a positional structure where Alves would take over the right winger role, Messi moves inside as a central midfielder, Alba pushes up as another left winger, while Suarez and Pedro remained largely in the forward line. Mascherano spent a large amount of the time in between his two central defenders even when there wasn’t huge pressure on the back line and Barcelona was in Rayo’s defensive third. This was a nice tweak in positioning which allowed Lucho to have 3 central defenders (if you count Mascherano as a true central defender nowadays) and allows Alves/Alba to push up. In central midfield they had Messi, Xavi, and Iniesta. In contrast to Rayo’s very ball-oriented movements in possession where they looked mostly to break through the flanks with combinations and attacking the penalty box afterwards – Barcelona was very well-spread out across the field while remaining connections within their positional structure. Iniesta had a more ‘Iniesta’ type of role we were used to seeing in the previous years of his career in this match. This is in large part due to Xavi’s involvement in the game. Usually Iniesta acts as a less present and less vertical Xavi when playing with the more adventurous Rakitic on his opposite side. In this game though, Iniesta had a higher focus on his penetrating dribbling ability and creating dangerous situation from it. It was interesting to see Iniesta and Messi shoulder the load in regards to creation rather than Neymar and Messi on opposite flanks like usual. Barcelona had a lot of the ball due to their pressing out of their 4-1-4-1 shape where they frequently had 4-1-3-1-1 halfspace pressing trap graduations, while also having flat out ‘forcing a long ball’ scenes. Mascherano did well when Iniesta or Xavi pressed higher next to Suarez to aggressively press balls put into the vacant halfspaces next to him – you could find him pressing the ball out on the flank very often. A lot of the time Vallecano were pushed wide even when they were attempting to play more towards the center because of these specific movements. After the red card Rayo played in what looked like a 4-4-1 momentarily but their shape was frequently manipulated due to their man-marking. It sometimes looked like a 5-2-2/3-4-2 as well. From there, Barcelona dominated the game more than they already had and scored a large amount of goals to put an exclamation point on their jump to the 1st place spot. This was quite an impressive performance for Barcelona and for Lucho. Things are looking brighter for Barcelona with each passing week and they still look on track for a possibly historical season – as I mentioned in my previous analysis on them. This is definitely a team to watch out for because it’s possible they might make history under everybody’s noses! In my opinion his view is too negative. You have to keep in mind that the team in the Pep era was one of the greatest in history, so using this as a standard might be a bit unfair. And some players changed over the years. Xavi can’t play a key role in every match anymore. So I think Enrique does a good job and some of his adjustments Pascual mentioned (increased focus on verticality, Messi’s new role) are fitting very well to the current situation. Good read anyway, I agree with him on many of his observations I just don’t think that they are that unproductive. And like I said before, although there are some variatons depending on the manager, in my opinion you can still recognize the “Barca style” if there is something like this. By the way, sorry if my english isn’t perfect, but I’m a german student. Yea, I don’t disagree with what you’re saying, all very good points, it is perhaps unfair to compare them now to Pep’s team! And Pascual always has good views on coaching and Barca(more so with the off field issues, of which they have many) but I agree he can be a bit negative as well. And no worries, I’ve read several books not originally written in English and translated so it’s not problem. That and you write in English better than many of my fellow Americans do! Actually, Suarez just revealed in an interview that it was not Luis Enrique, but Messi who initiated his new role as a right winger. Usual quality analysis from AO. I feel that Guillem Balague (Sky sports Spanish football ‘expert’) refuses to give Lucho any credit for Barcelona’s improvement and rise to the top of the table. He also claims that Barca have moved away from their philosophy which he thinks is bad news for the future, do you agree? I personally have Barca down as favourites to win the UCL and have done so since they signed Suarez. Definitely Enrique has to be given credit for the improvement of Barca over the last months, especially since the Sociedad match. Some tactical changes that work very well, for example Messi´s new role and his adjusted involvement, are really obvious. So who should be responsible for that, if not the coach? I would recommend you some articles that can explain this better than me but they´re all in german. And concerning the question of philosophy: Of course their style of playing at the moment is not exactly the same as what they played under Guardiola but for the`juego de posicion´of Pep it needs Pep himself. All in all they still have a style of playing you can identify them by besides the style of their actual coach, something that very few teams have. Just my opinion, based on what I see (around half of Barca´s league games this season) and, of course, read on Spielverlagerung. Especially in this match you could see that Balague is wrong, that they never “lost their philosophy” or something like that. There aren´t many teams on the world that would build up so calmly and ambitiously against the pressing of Rayo. Barca´s game is still based on the same main characteristics like it was before Lucho. The pressing and counterpressing even definitely improved in comparison to last season, although it´s not quite as spectacular as it was in the Pep era. And like AO said, the aspects of “positional play” are still very apparent. For me Barca as well is a very strong contender in the CL this year. Having read that, then watched this particular match, much of what he says can be seen very easily. Firstly thanks to everyone for replying to my comment (Valentin, TJP343 and AO). I agree with all your comments and I see Balague’s comments as a sort of personal attack on Luis Enrique who he constantly said is not the right man for the job despite the good job he is doing. As you say Valentin Rayo really did try to press Barca but they insisted on playing out from the back. As you have said (AO and Valentin) there clearly are still a number of differences between Pep and Lucho but their brand of football is still similar. Thanks to TJP343 I read that article and he does have a point! Barca do seem to be based more on a vertical axis and search for their forward players more! Generally though I still think that Balague is way too negative and does not seem to like Enrique. Hey AO, first of all, very good analysis, I feel like your english is improving which makes your articles clearer easier to read (and surely easier for you to write). Watching english football analysis would help because they use a lot of “technical terms” (even though they seldom know what they’re talking about). Now a question, with el classico coming up, do you think Ancelloti should instruct his player to adopt a more cautious approach or have them press higher up the pitch (although not in a man-oriented style)? What I suspect will happen (and what fits Real Madrid’s players better) is that they will defend deeper instead of pressing high up the pitch. That doesn’t mean they wont counterpress aggressively and high up the field though!